When you have asthma, your symptoms can vary from time to time and situation to situation. It can be difficult to know when changes in your symptoms are normal, and when they might mean trouble. That’s why it is recommended that you work with your doctor to create a written Asthma Action Plan. 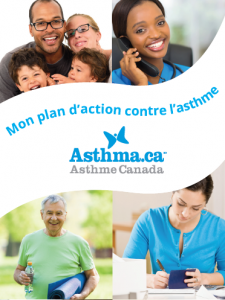 Check out these guidelines on how to print and make your own Asthma Action Plan to take with you to your next doctor’s appointment. Together, you can modify it as needed so that you always know when a change in your symptoms means something serious. An Asthma Action Plan is often used by doctors to help patients control their asthma. It allows you and your doctor to create a personalized program for managing your asthma. The plan is based on frequency and severity of symptoms and/or results of peak flow monitoring, and sets out how you should adjust your medication depending on how controlled your asthma is. If your asthma is well-controlled then you are in the Green Zone. Congratulations! You’re able to participate in normal activities, including strenuous physical activity. You are able to attend school or work and are sleeping through the night without asthma symptoms. You are not needing to use your reliever medication 4 or more times a week for asthma symptoms (except prior to one dose before exercise). You can live your normal lifestyle and continue taking your medications as prescribed by your doctor and as set out on your Asthma Action Plan. Understand that the controller medications you may be on at this time are controlling your asthma and its symptoms. You have difficulty asthma symptoms during regular activities or exercise. Your asthma symptoms begin to disturb your sleep. You get a cold or other chest infection. You need to take your reliever medication 4 or more times a week. You have missed work or school due to asthma symptoms. If you are in the yellow zone, talk to your doctor – it means your asthma is not totally controlled. This is the zone that most people are in as many people expect to have asthma symptoms. You should be able to manage your asthma so that you are symptom free! If you are in this yellow zone, you need to speak with your doctor to adjust your controller medication. If you’re experiencing severe asthma symptoms, your asthma is poorly controlled and you require immediate medical attention. See your Doctor immediately. If your symptoms are very severe, go to your Emergency Room at your local hospital. The 3 Zones of Asthma Care can be related to a traffic signal. When Green, you are clear to go. When Yellow, you must proceed with caution and pay attention to what is going on around you. When Red you would be proceeding in a dangerous situation. You never go from Green to Red but you must pass Yellow. This Yellow is your warning area, the time you need to make adjustments to your medication to return to the safe zone of Green. Having a personalized Asthma Action Plan will allow you to easily identify which zone you are in and what you must do to stay in the Green zone. Remember, it’s better to be safe than sorry. To delay getting medical help when you’re in the red zone can mean unnecessary suffering, even death. Always follow your Asthma Action Plan and your doctor’s advice about how best to manage your asthma.